Top quality large Ocean Jasper palm with super exposed crystalline areas - beautiful! 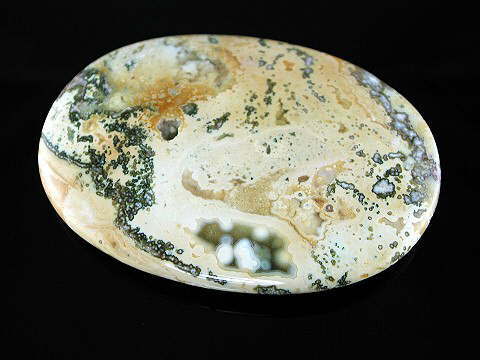 Ocean Jasper (also known as Orbicular Jasper) is very soothing and helps to love one's self as well as others. It is an emotional healer and helps brings peace of mind. It also assists with acceptance of responsibility and increases patience. The circulars patterns on Ocean Jasper symbolize unity and help us realize that we are all interconnected; as nature itself has a cyclical pattern. Being a type of jasper, it is a very protective stone, and any orbs or eyes, enhance this in regard to protection from dark, negative energies or the ‘evil eye’. It relates to the Heart Chakra. This palmstone is an excellent example of its kind and super quality.